Click here to download the Kid Klok app! Presenting KID KLOK™ — the easy to read educational clock and training accessories developed by Dominic W. Massaro, Ph.D. Dr. Massaro, a professor and expert in cognitive psychology at the University of California, Santa Cruz, applied both psychological and ergonomic principles to improve the traditional clock dial. His unique design reduces the confusion and frustration young students experience while being taught analog time. 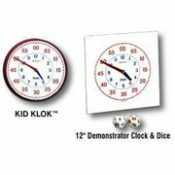 KID KLOK™ segregates the hour and minute numerals and creates a simple visual association to the hands through size and color. Dr. Massaro’s own classroom program explains how KID KLOK™ Demonstrator Clocks and color coordinated KID KLOK™ Training Dice are used to create attention getting, time learning games.